McCranie’s Red Ribbon, vintage 1996 in a smooth straight WW2 Pre-Republic Peterson Sterling Canadian with a sterling silver band and a black vulcanite p-lip stem. Peretti's Thanksgiving Day in a bent billiard SMS meerschaum, totally mucked-up in appearance by the owner's lack of interest in caring. Butera era Pelican in a 2002 Ser Jacopo Delecta Fatta A Mano R1 sandblast Rhodesian with a smooth extension at the shank with a black acrylic stem. Ice water and bergs is my evening drink. Peretti Coffee Blend in a 1979 smooth slight bend H. Jones Ltd. Easy Loader 391 Dublin with a black vulcanite stem. Best to you. I know it's a bummer. Just finished smoking McClelland 5100 in a 1980 Stanwell 668 medium bend with a multi-colored ferrule, half black sandblasted, half brown smooth, rough top with a black vulcanite stem. Now smoking D&R Three Sails in a 1980s straight smooth Big Ben pot with a nickel band and a black vulcanite stem. Have enough left for one more bowl. Watching the Braves-Giants game. D&R VIP in a 2004 smooth long shank Canadian Trever Talbot Ligne Bretagne Faite en Bretagne 4/3 with a black vulcanite stem. Just finished smoking C&D Burley Flake #3 in a 1980s Peterson 314 Full Bend black Sandblast system pipe with a black vulcanite p-lip stem. GLP Jack Knife RR in a smooth medium bend post-WW2 Pre-Republic Peterson Shamrock Killarney 9BC with a sterling silver band and a black vulcanite stem. 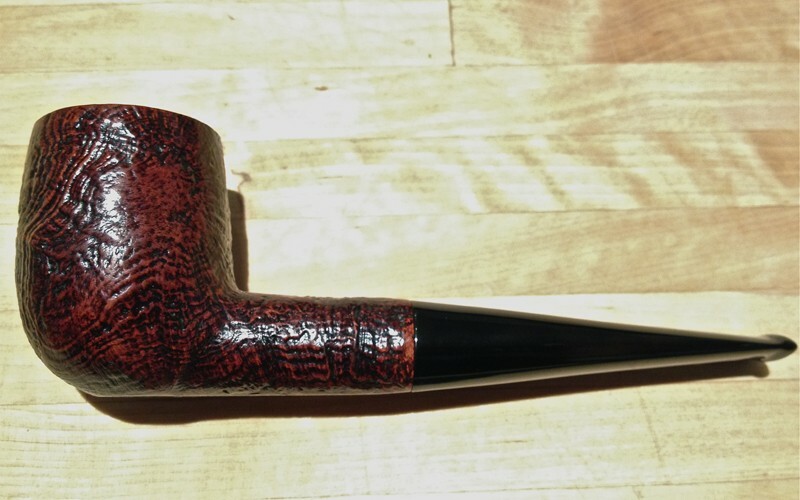 2012 Louisiana Red in a 2003 medium bend Nording 4 rough top sitter with a small rusticated area at the top left and a with a black vulcanite stem. 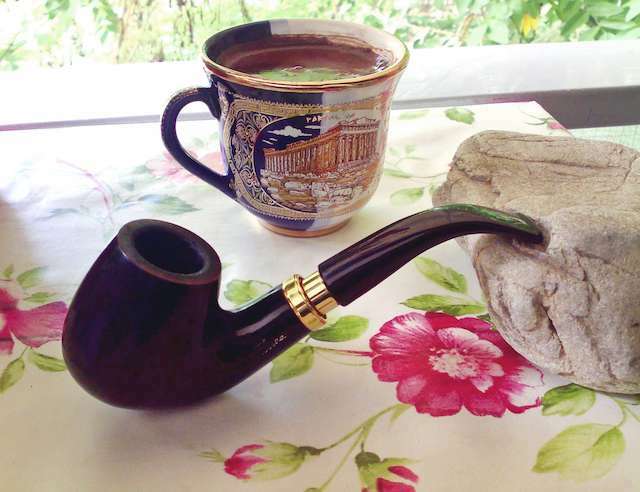 Good morning from Greece, sunny day here in Athens with few clouds and 21º C, i went to the market to buy another 2 cups for my Greek coffee with ancient Greek content on them and some bits for pipe rusticating. W.O Larsen True Delight - Aldo Morelli. Half way through this bowl of Peretti Cuban Mixture in a 2016 Peretti's M.T. 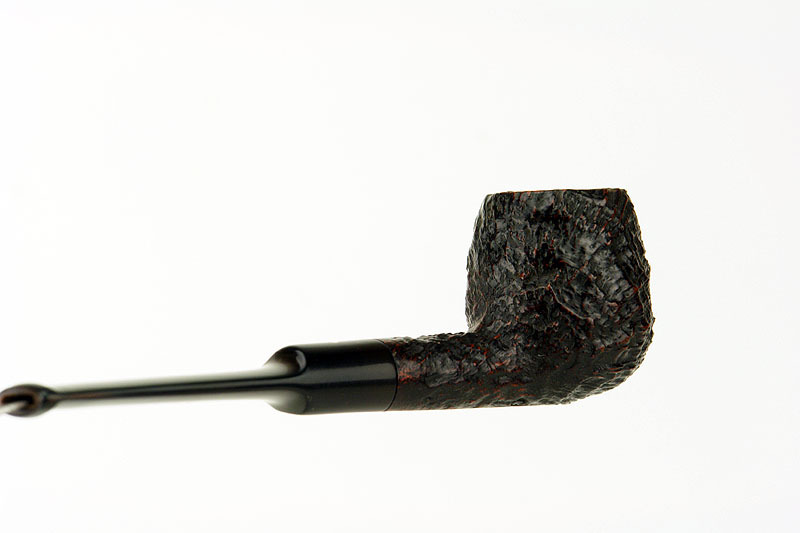 Natural made in Holland straight smooth brown Algerian briar billiard with a black vulcanite stem. A bottle of Caruso's Maraschino Cherry Cola Italian Style Soda made with pure cane sugar is my drink. Half way through this bowl of Watch City Old Dominion in a smooth straight early ‘60s Lane era “William Conrad” Charatan Executive Extra Large stretch apple with diagonal channel cuts on the lower right and left of the bowl along with a black vulcanite double comfort stem. 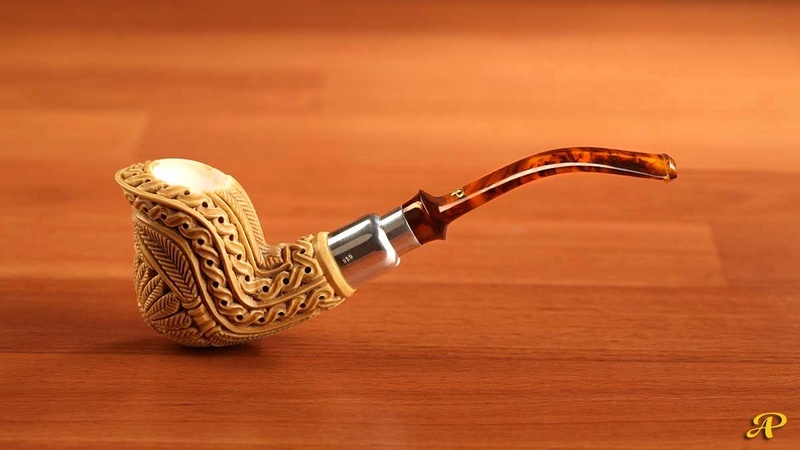 Paul Olsen Red Caledonian MOB in a 1975 medium bend sandblasted looking, smooth on the sides yellow Pioneer meer with a black vulcanite stem. Smoking some of one of my fave Red Va's, McC's 5100 in my 1940s Dunhill Shell Apple my daughter bought me a few years ago. Oil cured old Algerian Briar and Red Va a match made in heaven !! A quarter of the way through this bowl of Sutliff Lord Fairfax in a medium bend smooth paneled 2017 Turkish Meerschaum with a gold and black swirl acrylic stem. Have enough for one more bowl. Ice tea and bergs is my drink. [i admit that i didn't knew about the use of Camels on that era].